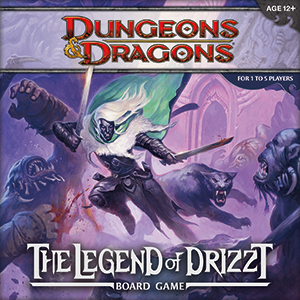 The Legend of Drizzt is 1-5 Co-Op dungeon crawler that plunges players deep into the labyrinthine caverns of the Underdark, the home of the dark elves known as the Drow. 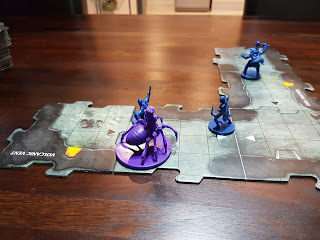 Here players will assume the roles of the most legendary Drow of all time Drizzt Do'Urden and his companions Cattie-Brie, Wulfgar, Regis and Bruenor Battlehammer as they journey ever onward towards Menzoberranzan, the City of Spiders, ruled by the terrifying demon queen Lolth. 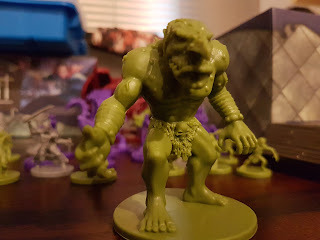 Along the way they will battle goblins and spirits, contend with trolls and spiders and overcome the nasty surprises that lurk within these mysterious caverns. 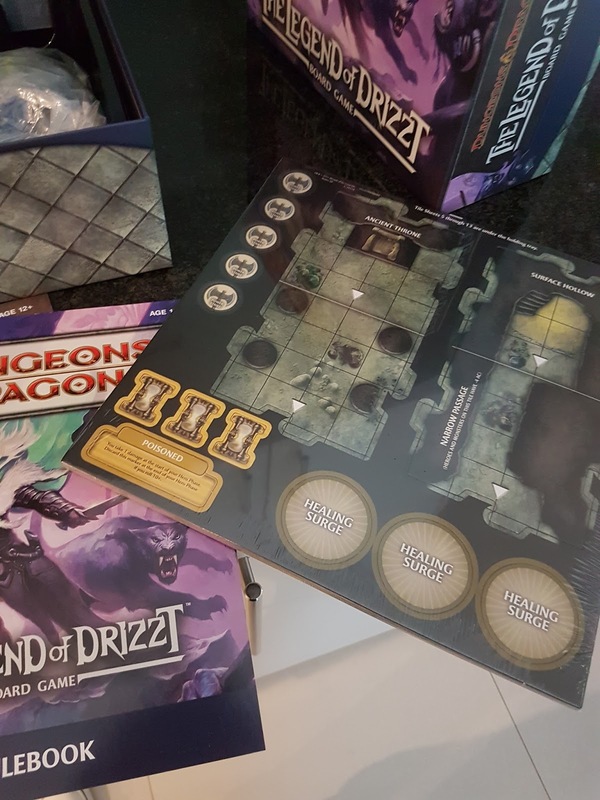 The Legend of Drizzt: The board game is the essential Dungeons and Dragons experience and hearkens back to my teenage years of rainy days indoors with a lunchbox of snacks and a thick yellow-stained library book. R.A Salvatore is the distinguished creator of the Drizzt series and his books provided me with hours on end exploring the worlds of the Drow and the Forgotten Realms. Salvatore later went on to pen an entire history for my favourite fantasy RPG video game of ALL time: Kingdoms of Amalur: Reckoning. Onward to board games and we have The Legend of Drizzt, a sweet homage to Salvatore, designed by Wizkids and in the same lieu as Castle Ravenloft. It has the same gaming engine and pretty much the same rules. There's still the same sequence of phases: hero phase, exploration phase and villain phase except you're exploring caverns instead of dungeons and there is now a 'cavern' tile stack instead of a dungeon one. You're still fighting monsters that pop up on every new tile that gets placed. There are still encounter cards and boss-type villains to contend with and a book of preset scenario adventures. 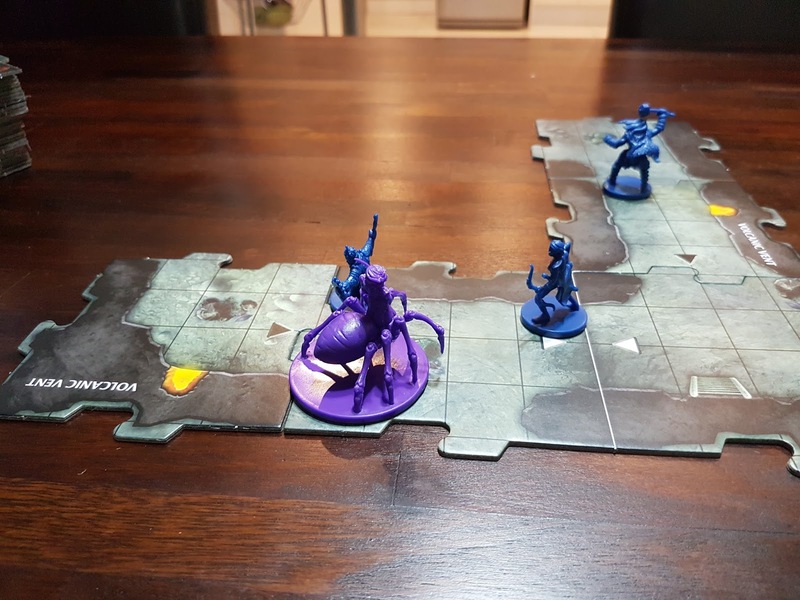 So yes, it's pretty much Ravenloft - but in the Drizzt universe and with a few notable and worthy exceptions: Apart from strictly co-op, there are also a few competitive scenarios which has players squaring off against each other to complete some or other objective. Then there is the addition of cavern edge tiles which close off some unexplored edges, adding to the claustrophobia of the tunnel-like Underdark. And lastly, there are a lot more Heroes in this box than in both Ravenloft and Ashardalon. Many of these heroes only make an appearance in later scenarios (i.e.Artemis, Jarlaxle) and while the adventure book is pretty much self contained, there is a strong feel towards a story-driven campaign. 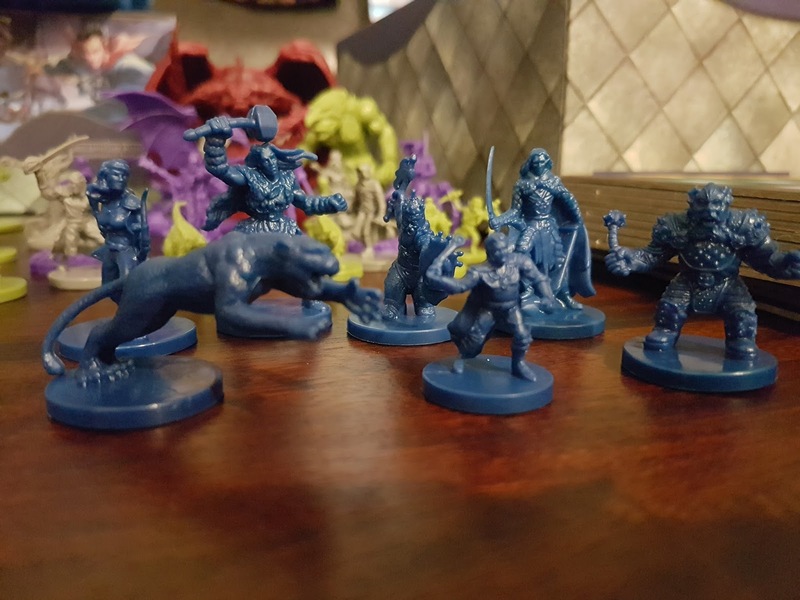 The Heroes of the Underdark! It's another giant box with 42 neatly sculpted unpainted miniatures, 200 cards and lots of cardboard tiles, tokens, items, chits and bits. Oh and, as per usual, really awesome artwork..Each of the heroes and villains have their own stats card which includes their respective abilities and by thunder, do these heroes have abilities! Drizzt,for example, can do two attacks in his hero phase and the introduction of stance tokens makes for a very interesting dynamic. Drizzt can even summon his ever-faithful panther Guenhwyvar! As before, there's usually a special tile that needs be found to trigger the end of scenario events and it's usually placed after the 8th tile in the stack. Some scenarios call for a pre-built cavern complex but apart from these, setup is the same as with Ravenloft. Check my Castle Ravenloft explanation on game play. The mechanics are exactly the same for Drizzt. Like with Ravenloft, this is a perfect game for players (and especially younger players) wanting an entry into the world of Dungeons and Dragons but without being boggled down by a dedicated Dungeon Master. 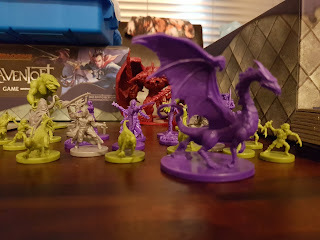 It's a fun game, easy to teach and has loads of references to the Drizzt books series which, if you a fan of as I am, will provide you with hours on end of entertainment. The game also features my favourite Clan Battlehammer dwarf : Bruenor and I thoroughly enjoyed playing with him almost as much as I did with the titular dark elf. Drizzt can also be combined with Ashardalon, Ravenloft and the Temple of Elemental Evil to for one hefty campaign. That said, Drizzt has a few set backs. However, most of these are minor and can be overlooked. I did find the heroes very over-powered compared to other iterations. 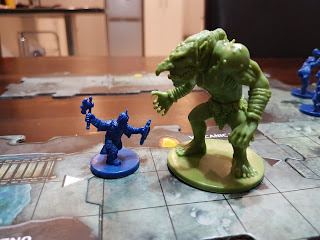 I also found the adventures and boss-type monsters in CR to be more engaging and challenging that those in Drizzt (albeit with one or two exceptions). Still, this is D&D, and its Forgotten Realms which makes it one of those games that I will constantly replay. Particularly on a dark winter's day when the gloom of the weather makes for a solid afternoon of exploring caverns deep below the surface of the earth. I look forward to adding both Wrath of Ashardalon and the just released Tomb of Annihilation to my collection soon! Bruenor roasting some. Sticky dragon wings anyone? Bruenor teaching Mr Ugly the proper salsa stance. Hey man - I'm not sure if anyone ever commented on your blog, and I do not mean to offend you by saying that. I for one, would like to thank you. I really like your reviews, they are to the point and honest. They have also helped me decide on purchasing these games. 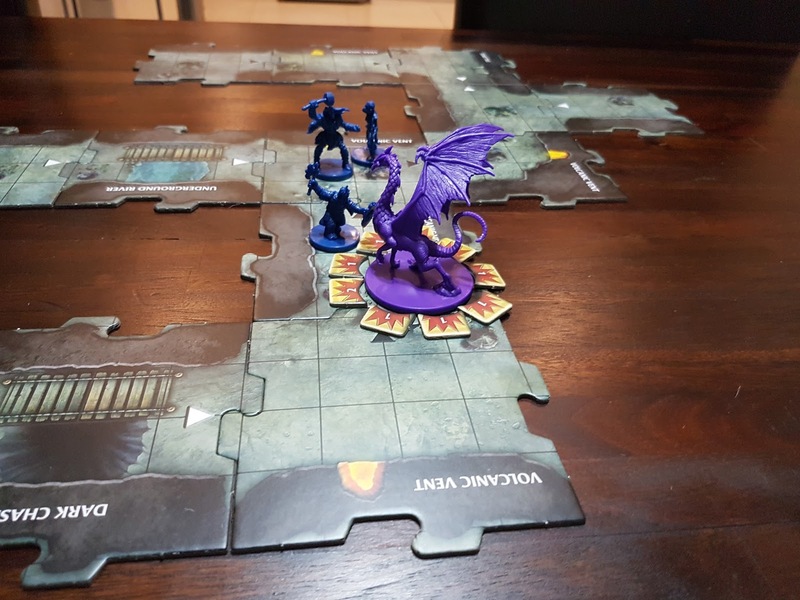 I really really like the custom campaign you made for Ravenloft - it really inspired me to continue creating my own custom content. I really hope you haven't abandoned your blog - I will check back hoping that you have continued writing up new custom ideas to expand the board games you have and inspiring others to do the same - all for the sake of keeping the DnD spirit alive.